Maple Roasted Acorn Squash: A little bit sweet, a little bit spicy, and every bit delicious, this roasted acorn squash with maple syrup and paprika is melt in your mouth tender and is the best way to enjoy this seasonal fall vegetable. Why is it that acorn squash seems to not get as much recognition as Butternut Squash? This mild squash is easy to prepare, easier to cut than a butternut squash, and so tasty! Paired with maple syrup and paprika, acorn squash slices are roasted until they taste both sweet and savory. My husband said that this squash recipe tasted like caramel corn to him–and I could see where he came up with that analogy. The acorn squash has a nutty bite and the maple syrup is perfectly sweet. The salt and paprika just balance this dish perfectly and allow the flavors to work harmoniously together. This easy squash dish is so easy it is perfect for a weeknight meal, but yet impressive enough for your holiday dinner as well. Cut the acorn squash in half crosswise. Scoop out the seeds with a spoon and discard seeds and membrane. Cut each squash half into half again. Cut each quarter of the squash into 1 inch crescent-shaped slices. Can you eat the Skin of an Acorn Squash? The peel of an acorn squash is so thin, there is no need to peel your acorn squash before roasting. The skin of the acorn squash is not only edible, but full of fiber and nutrients. 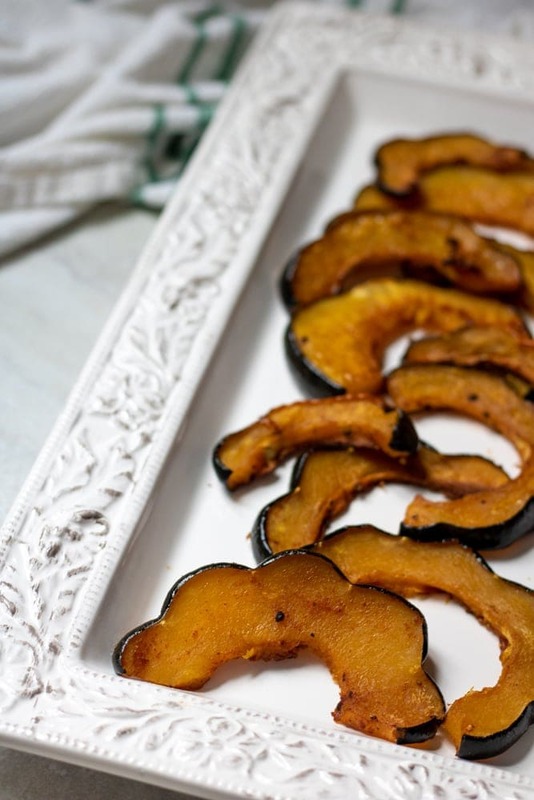 Toss Acorn Squash Slices with oil, maple syrup, paprika and salt and pepper. 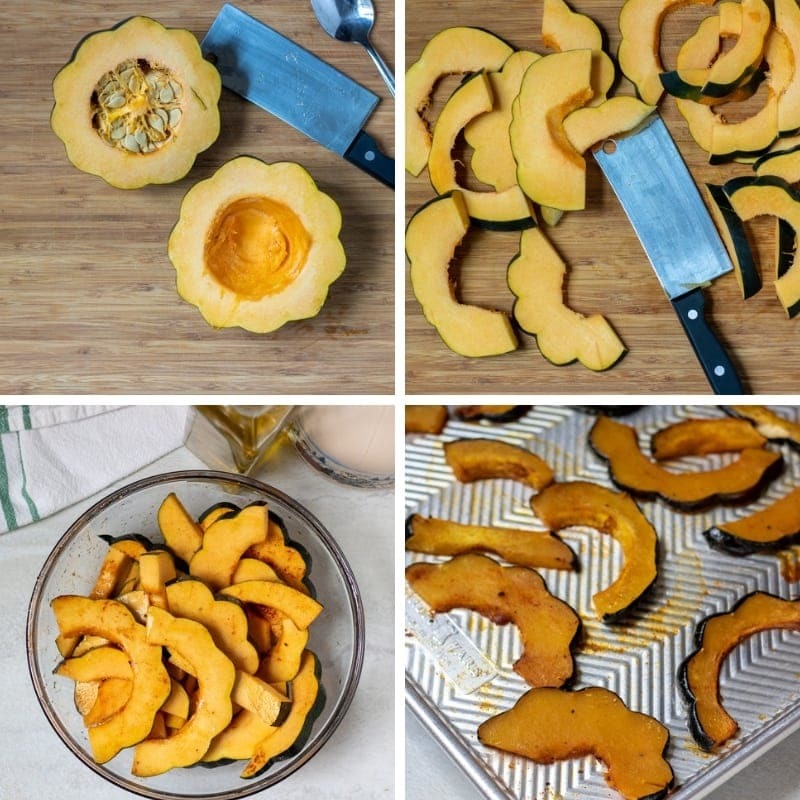 Spread acorn squash slices out evenly onto a large baking sheet. Do not overcrowd the baking sheet, as this will cause the squash to steam instead of roasting. Use two baking sheets if needed. Roast for 20 minutes on one side. Remove squash from oven and flip. Roast for an additional 10 minutes. Feel free to use melted coconut oil in place of the olive oil for a richer acorn squash dish. I love to top these acorn squash slices with toasted nuts as well for a bit a of crunch. The paprika helps to balance out the sweetness of the maple syrup, but you can omit for a sweet side dish. Acorn squash slices are roasted until tender with maple syrup and paprika for a sweet and savory easy side dish. Toss sliced acorn squash with olive oil, salt, paprika, and maple syrup. Lay squash slices evenly on large baking sheet, being careful to not crowd the baking dish. Roast for 20 minutes and then flip the squash and roast for an additional 10 minutes. I have been trying to find some new squash ideas! This looks like a good one! This is a PERFECT recipe for squash. Enjoy Sarah. What a lovely and simple side dish. The maple and paprika sound amazing together! Thank you Katherine. It is a perfect sweet and savory combo! Hubby is making this today. Can’t wait to taste it! YAY!!! I hope you enjoy Sandra!